Arabic is one of the UN offical languages spoken by over 200 million people in 20 countries mainly in the Gulf region and North Africa. MAPS topo supports all Arabic oriented Romanization systems including UNGEGN and variants i.e. UNGEGN2002, BGN/PCGN1956, RJGC, IGN, ISO, and SES. Arabic Romanization is not only restricted to the "official" systems since MAPS can also export geographical Arabic names to over 50 languages and in their native scripts, all EU official languages, Russian, Afrikaans, Icelandic, and Turkish are included for example. MAPSTopo© also does another wider transcription for Arabic place names, this utilizes IPA plus user custom transcription system. The reverse process is also possible i.e. retrieval of any transribed Arabic place name or Arabicized non-Arabic place name. Another module is responsible of Arabicizing any non-Arabic toponym. 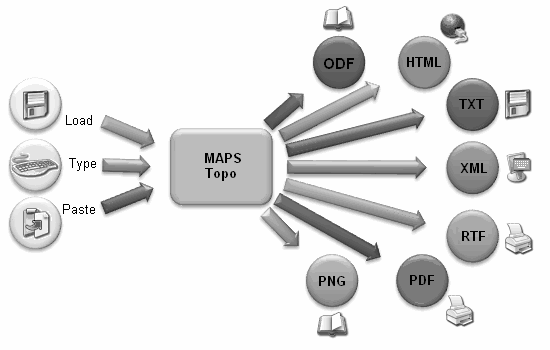 MAPS Topo functional diagram showing varieties of input/output, you can view the technical specifications. Shown below is a typical screenshot of the system working on sample data, the system is also capable of doing the reverse i.e. generating the Arabic script of the geographical names written in any of the supported Arabic Romanization systems. View software specifications. Please refer to Romanizer for details. A screenshot of the MAPSTopo (Romanization) interface, you can view the more information and sample output. A direct Arabicization of grographical name is straightforward if the input is written in native script, the name's inherent phonemic characteristics are kept through various stages of Arabicization process. This system is based on thorough listing of language phonetic rules that are used to Arabicize place names from 20 different languages, place names can be input in their original script or as romanized version where improvement to Arabicization process is done through pattern matching and other accuracy measurments used for transliteration. View software specifications. Please refer Arabicizing System for details. A round-trip name transcription system is not easy to accomplish, the name's inherent orthographic characteristics are totally lost when exported to another language. This is a major challenge for information retrieval systems utilized in CLIR applications. View software specifications. Please refer Retrieval System for details. A screenshot of the MAPSTopo (Retrieval) interface, you can view the more information and sample output. This module is currently being developed. Please refer Personal Names Transcription System for details.